It is his Austrian banker/long-lost twin sister, who would never have made a secret deal, even with family. Ms. Kohn appeared as a witness at a London trial for a civil lawsuit brought by Grant Thornton, the liquidators of Mr. Madoff&apos;s U.K. business, Madoff Securities International Ltd., to reclaim about £33m ($49 million) on behalf of investors. Ms. Kohn denied any wrongdoing; liquidators don&apos;t allege that she knew of Mr. Madoff&apos;s fraud…. "There has not been a private agreement with me and Mr. Madoff," Ms. Kohn testified. She added that it should have been "obvious" to the directors of the London business that her payments were made for the introductions she made to Mr. Madoff, given her reputation in the press as a highly connected banker. She said: "None of [the press reports] spoke of me like an analyst or a research guy." No more Formica discount in Montauk. 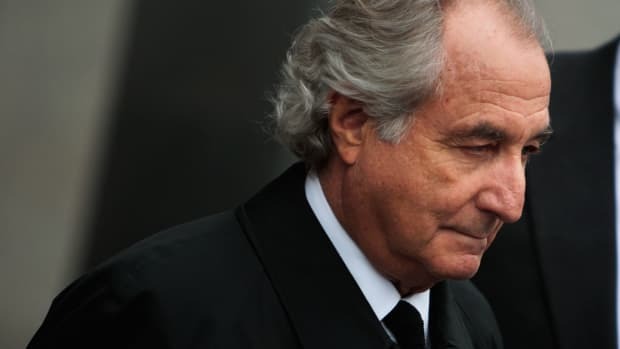 Bernie Madoff Not Getting Any In The Can?